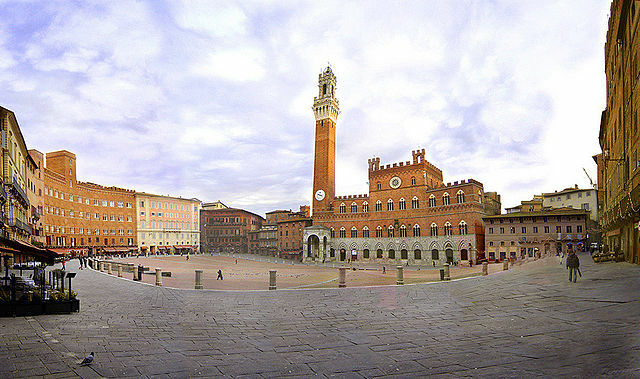 Siena Italy, tourist attractions and information. Siena Italy, is a city of art, mystic and sweet, passionate and generous. It is pleasant to walk without goal in its gotic small streets, fenced side by side from palaces. The city lies on three hills of red clay, and is encircled from walls. It is said that Siena has been founded at the beginning of the Roman era from Senio and Aschio, sons of Remo, the founder of Rome, according to the legend togheter with his twin-brother Romolo. This explains the emblema of Siena with the coat of arms representing the wolf and the twins, same symbol as Rome. 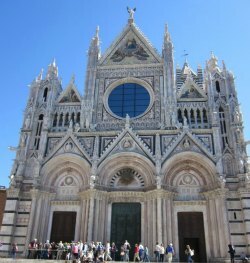 One of the numerous art treasures is the Duomo (12th-14th century Cathedral), a very high expression of the Romanesque-Gothic art, with numerous paintings, sculptures and several works of architecture. In the Medieval era (12th to 14th Century) Siena becomes free municipality, the commerce and bank activity made the town really prosperous (here is born the most ancient and still existing bank in the world, "Monte dei Paschi di Siena", since 1472). Siena is a magnificent city with wards and towers, narrow streets, craft shops and buildings that make it a must for Italian and foreign tourists. It is divided into 17 districts called Contrade: Aquila, Bruco, Chiocciola, Civetta, Drago, Giraffa, Istrice, Leocorno, Lupa, Nicchio, Oca, Onda, Pantera, Selva, Tartuca, Torre, Valdimontone. A strong Italy tourist attraction is the "Palio delle Contrade" , popular festivity since 1656 on the 2nd of July and August 16th. The palio is preceded by an historical procession revoking the wealth and independence of the Republic of Siena. On August 16th it is repeated and has its final in the spectacular (and very dangerous) horse race in "Piazza del Campo". Siena is located in the Chianti area, home of the famous wine, and is also a lovely piece of Tuscany which houses charming villages like Castellina and dense vineyards as those of Gaiole in Chianti, Castelnuovo Berardenga and Radda in Chianti, with gourmet food and wine tours.